In recent years, we have become more involved in the design and installation of large finishing plant. This has led to the creation of an industrial division with a special team of project engineers responsible for liaison with the customer from enquiry stage to commissioning of the plant. It is the project engineer, with his wide knowledge and experience of finishing methods and problems throughout the world, who makes the first assessment of the customers needs, translates them into suggestions, designs, costing, quotations and, ultimately, into hardware and that is where the erection teams take over, working days often nights and even weekends as well, to make sure that the installation is ready when the customer wants it. 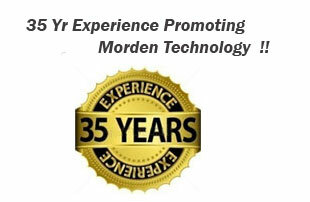 Our philosophy is to serve our customers as a equipment and Technology. Our goal is to be your finishing partner from custom turnkey system design and custom build to individual equipment sales and service and to trial run & commercial production. 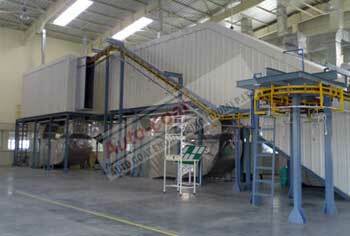 Conveyorised paint shops are used for painting of components for mass producations . These are of two types side draft water wash and down draft water wash. Side draft water wash booths are useful for small or lightweight components, where painting is done standing in one position. For heavy components, down draft water wash painting booths are useful. In this booth, the operator can paint the job by moving all around it. These painting booths have the following features: adequate exhaust resulting in effective removal of over spray paint particles and eliminating settling on wet painted surface; provides clean air to the operator; and washing action minimizes escape of paint along with exhaust air thus eliminating surrounding pollution and also elimination of fire risk. A complete SURFACE COATING PLANT is a combination of spray paint booths as per two coat or 3 coat system , with a curing oven and an air supply unit for keeping the whole environment dust free. We are most experienced manufacturers of TURNKEY PAINTING PLANT OR TURNKEY PAINT SHOP. We have been manufacturing superior quality Surface Coating Plant IN INDIA among other valuable products for the last 50 years. We are among the leading MANUFACTURERS OF CONVEYORISED PLANTS in India for quality manufacturing. We have most professional Engineers for Designing with AutoCAD facility to manufacture Turn Key Painting Plant as per different application. Once installed SPRAY PAINTING PLANT can operate round the clock without any increase in capital equipment. A plant with an overhead conveyor for transportation of components will normally leave the floor area clear for storage and other movement of material. The objects to be sprayed are moved at a predetermined speed and convenient height. This reduces operator fatigue, and results in greater efficiency and increased output. The cost of painting would be greatly reduced as the output of the paint is increased by the operation of additional shifts. Conveyorised Painting Plant is engineered for maximum efficiency and economy. The SPRAY PAINTING PLANT are designed to maintain an adequate velocity of clean air at t he operator's breathing level and ensure that all the overspray paint is sucked into water tank. By keeping the operator's breathing level free from solvent and overspray paint, it is .possible to make the operators work continuously for longer periods, thereby increasing production and improving the quality of work. Spray painting booths used in such kind of system are totally enclosed and dust free. If you wish to expand your paint shop and space is a problem, it will pay you to investigate this type of installation. Autocoat Engineering is the most experienced Surface Coating Plant Manufacturer in India Spray booth Manufacturer since last 35 years in India. Autocoat Engineering have been manufacturing superior quality Spray booth among other valuable products .We have wide experience of manufacturing PAINT BOOTH with different material handling and different product size , and different production volume.